SELECT HEADBOARD | LOW 26.5"
SELECT FOOTBOARD | LOW 17"
Our beds are all made to order. For Queen or King Beds, click here. The Dorma Bed is simple, yet sophisticated, and will bring clean lines and distinct style to your child's bedroom. Its sturdy construction and fully upholstered frame make it ideal for your child's first "real" bed or for your teen's modern aesthetic. Matching storage bench also available. Sleepovers are an exciting and fun part of growing up! 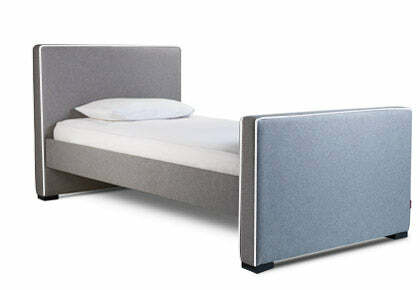 The Monte Trundle Bed is a customizable roll out bed that fits underneath the Twin (single) or Full (double) sized bed. It can be used as an extra bed for sleepovers (trundle bed and mattress sold separately) or as extra storage for toys and clothing. To use as a storage piece you may custom fit material such as hard cardboard (not included) and lay it out over the wooden slats to create a solid platform. Trundle bed measures 72" X 40"
The trundle mattress is custom made the our roll out trundle bed. You're finally ready to design your child's awesome toddler bedroom, but you can't find any nice guard rails...we have the solution! This additional item is unique and fully upholstered. Toddler guard rails will keep your little one from rolling off the Dorma Bed, yet you won't be sacrificing the beauty of the bedroom. When your child doesn't need the guard rail(s) any longer, simply replace them with the original rail(s) -- no tools required! Trundle Bed: 74" x 40" x 7.5"
Top of mattress slats to floor: 12"